Before assuming the role of Canon in the Diocese of Utah, Canon Nestler was Dean and President of the Episcopal Theological School at Claremont from 1992-2006 and a member of the faculty from 1981. This leadership in the theological education and formation of lay and clergy leaders will enhance Mary June’s collaboration with the St. George’s College staﬀ and visiting lecturers. Canon Nestler was a member of the Archbishop of Canterbury’s Anglican/Oriental Orthodox International Dialogues in 1993. 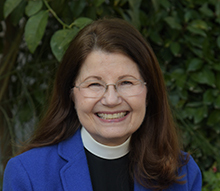 Canon Nestler brings her extensive church historical and archaeological credentials to integrate in her work as our new Course Director. She has been a consulting archaeologist and area supervisor for the Mount Carmel Project, Haifa, Israel, since 1998, and was also an area supervisor at Sepphoris for seven seasons (where her team discovered the “Mona Lisa” mosaic) and Capernaum. Canon Nestler holds a C.Phil. from the University of California in early church history, an M.A. from St. Mary’s Seminary and University Ecumenical Institute, an MDiv. from The General Theological Seminary, and a B. Music, from The Curtis Institute of Music. As a Fellow of The Episcopal Church Foundation, she studied also at Jesus College, Cambridge, where she focused on Christian origins and Syriac language. Well known in our college community, Canon Nestler served from 1985-1991 and since 2014 as a visiting scholar leading courses for St. George’s College. We look forward to the extensive gifts of historical, archaeological, and biblical scholarship and institutional leadership that Canon Nestler will bring to St. George’s College. Her anticipated start date is July, 2018.